The combination of rain and tea is indeed a match made in heaven. Especially in Delhi when the monsoon brings respite from the sweltering heat and the cool showers wash the grime away to reveal brighter shades of green all over the city, there’s something very comforting about savouring a warm cup of tea. As much as I like this whole idea I have never really developed a liking for the masala chai with milk that most Indian households wake up to. The only way I have enjoyed tea is whenever I dipped a biscuit in it, and even then rarely ever sipped the tea that was left after I had had my fill of the biscuits. Which is why I accept the invitation for tea tasting at The Oberoi Patisserie & Delicatessen: because a tea expert from Newby Teas is here to share the nuances, brewing techniques and other tea trivia through the rainy month of July. And after tasting some 14 cups of tea I can safely say that if this is the kind of tea one can have I can happily become a tea-drinker! The beautiful and tasteful teas. This tea tasting, the first ever for me, is much like wine tasting or whiskey appreciation. There are 14 types of tea that are brewed right in front of me, starting from the Indian Darjeeling tea and Masala Chai, moving on to the Japanese Genmaicha and Gyokuro, then the Chinese Oriental Sencha and Jasmine Pearls. 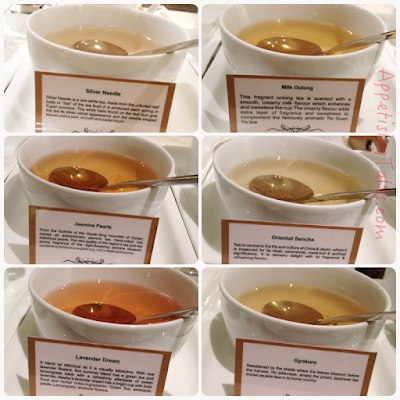 The progression of tea moves from black to green to the caffeine-free Silver Needle white tea. Then there are teas or tisanes that have no tea but have been infused with fruits like the Tropical Delight and Rosehip & Hibiscus. 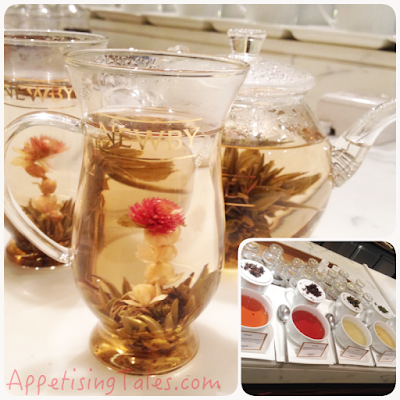 I am also shown different types of tea leaves, flowers and fruits that have been used for the infusion. Each tea comes with detailed notes like wines/malt whiskies. While I am taken through 14 cups of tea, each with its distinct aroma and flavour, I am told interesting tea stories like the origin of the tea bag or the accidental creation of the first ever iced tea. I reckon that this tea tasting will be as enjoyable to tea connoisseurs who will appreciate their premium quality as it is for a ‘newby’ like me. I especially like the smoothness of the Silver Needle, the delicious caramel aroma of the Milk Oolong, the taste of the Chamomile, the uniqueness of the Rooibos Tiramisu and finally the beauty of a flower blooming in front of my eyes or the Mini Flowering Tea! 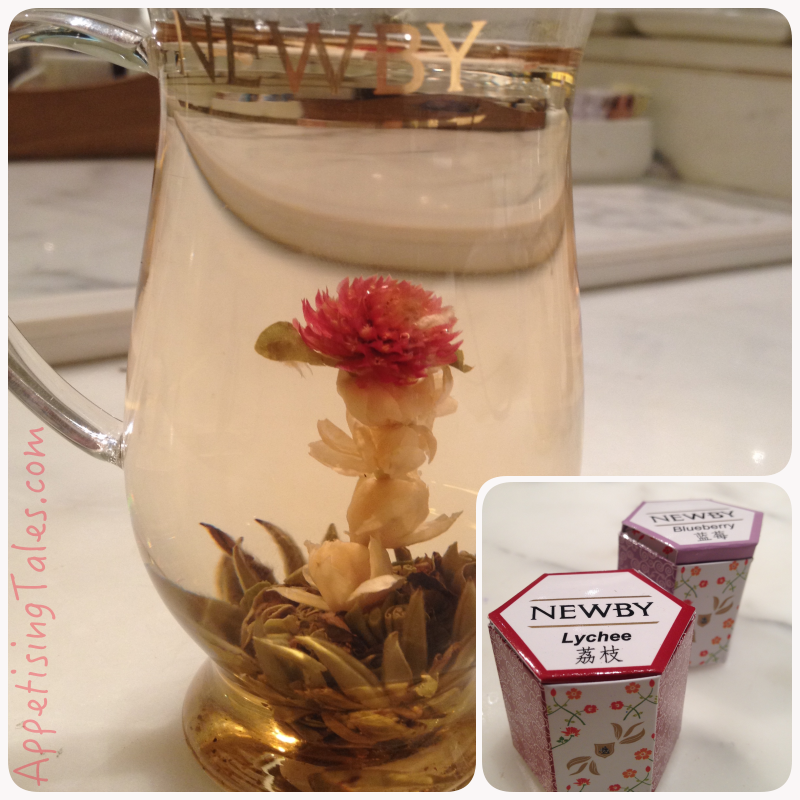 The flowering tea blooms in my cup! The tea tasting is free of charge through the month of July. It's a fun thing to do, either on your own or with a bunch of friends. After the tasting session you can order the tea of your choice along with an appetising assortment of freshly baked croissants, muffins, Danish, macaroons, or a variety of gourmet snacks, salads and sandwiches that will be charged on an a la carte basis. 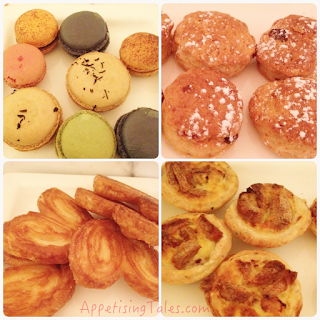 A choice of macaroons, scones, quiches, palmiers and more. Timings: Tea Tasting is from 3:30 pm – 6:30 pm. Prices: Premium Teas like English Breakfast, Earl Grey, Darjeeling Rs 350 onwards; Special Premium Teas like Jasmine Pearls, Lavender Dream, Green Sencha, Oriental Sencha Rs 395 onwards; Macroons Rs 150 per piece; Savouries Rs 200 onwards.